Today Google Weddings launched, promising that the company which is gradually taking over every aspect of our lives can now "simplify wedding planning." 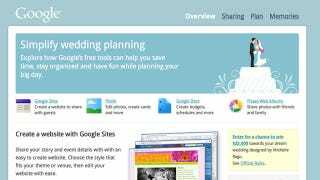 Basically, the site just highlights existing tools like Google Sites, Picnik, Google Docs, and Picasa and shows how you can use them to set up your wedding website, share pictures with guests, and organize your guest list. The only new features are a dozen website designs by wedding planner Michelle Rago, and Google Docs templates for soliciting addresses from your guests, coordinating vendors, and keeping track of gifts. Though it's probably easier to use Google's pre-made seating chart spreadsheet than to spend hours trying to make one yourself in Excel, that's not the site's key advantage. There are hundreds of sites that already offer wedding planning tools, but Google Weddings is probably the only one you and your fiance are already signed up for. Brides.com and TheKnot.com offer similar features and more attractive templates, but in order to use them with your future spouse, you'll have to get him logged onto the site. The site isn't perfect; The wedding designs are pretty bland and all the templates feature the same cookie-cutter heterosexual couple (you can change the text in documents to feature two brides or two grooms). However, if you're looking for a way to organize your wedding without being assaulted by images of diamonds and dresses, using Google tools you're already familiar with may be a good alternative. That is, as long as your don't mind the company having access to your bridal registry along with copies of all your emails and satellite pictures of your front porch.